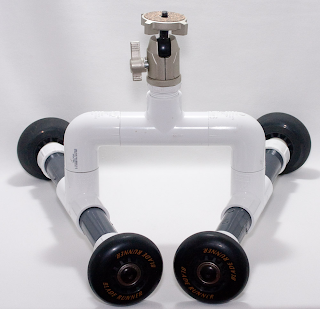 A table dolly is a small, low profile camera support designed to be used on a table top and often used to add movement to product shots. Its axles are usually adjustable to allow it to travel in straight lines or curves and circles. It can be used for a lot more than product shots though. On a suitable, smooth floor it can be used for low-angle tracking and trucking shots. If you have a folding table (borrow one from craft services if you don’t) or a board on a couple of saw horses you can also easily simulate a slider or a traditional full sized tripod and dolly movement. There are lots of commercial table dollies available at all sorts of price points. A lot of people have also made DIY versions ranging from the complex copies of the commercial offerings to a bean bag balanced on a skateboard. This version is very influenced by the Frugal Filmmaker’s project (http://filmflap.blogspot.com/2010/06/make-pvc-table-dolly-for-under-20.html I’m a big fan of his video tutorials and attitude) with a few key differences. The main one is that his design is intended for smaller camcorders but I wanted to be able to use it with a larger DSLR with a decent lens too. Too this end I needed the dolly to be more stable, so I made it have a larger wheel base. I also wanted it to take a more substantial head so I made it accept any standard head with a 1/4” screw mount. Being lazy, I didn’t want to have to cut any PVC pipe either so I came up with a simple drill, glue and screw design using easily sourced, hardware store, parts. 5x 1/4” diameter, 1.5”long machine screws and appropriate washers and nuts for axles and to mount head. 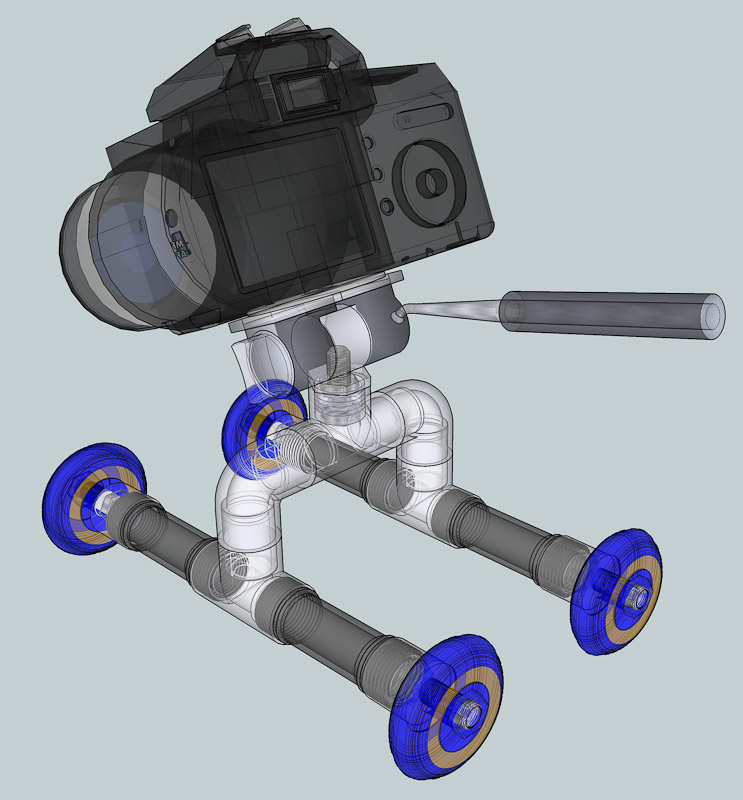 If you salvage the axles from the skate wheels you only need 1 screw to mount the tripod head. Optional: Goof-off or some kind of solvent to remove the sticker residue. Remove the wheels from the skate. 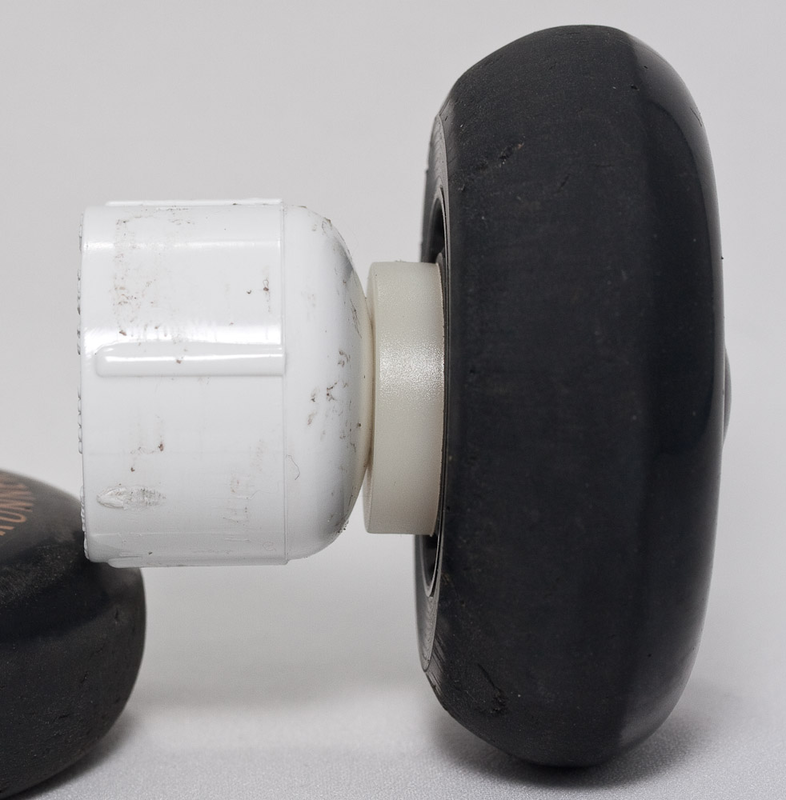 If the axles on the skate are useable, salvage them as well. 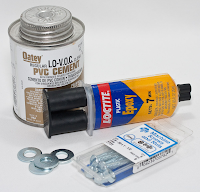 Remove stickers from the PVC components. This is the hardest part of the project but with the stickers covering all these components they won’t go together properly. Drill a hole in the center of each of the screw on end caps. Screw the wheels on to the end caps. Use a washer or two between the cap and the wheel and the nut and the wheel. 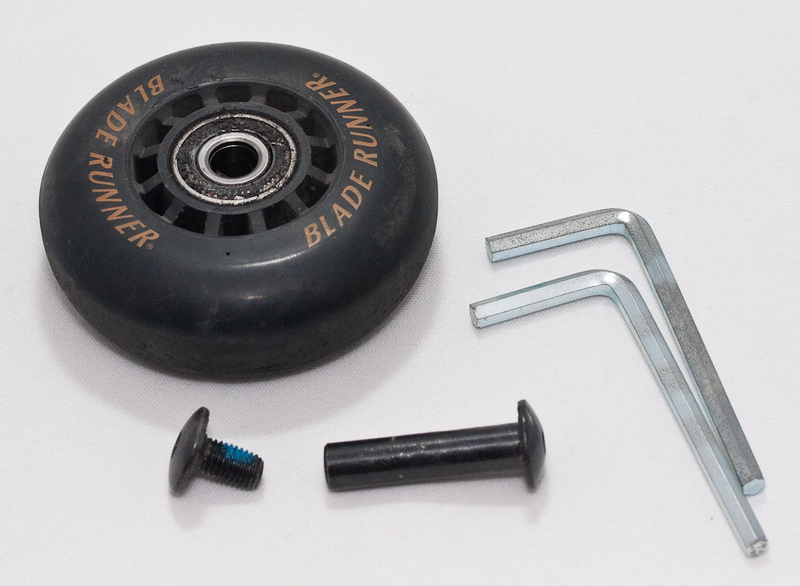 You can either use new hardware or the original axles from the skate. I used the original skate axles (hex keys required) and nylon washers I had lying around between the end caps and the wheels. The wheels need to be tight enough to be held securely but not so tight that they don’t run freely. 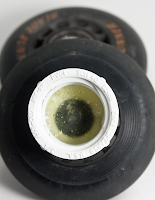 Glue the axle in place in the end cap using the epoxy for further rigidity. Set aside to cure. Glue a riser into each side of a plain T-joint using PVC Cement and a connector into the top of it - repeat for the other set of running gear. Screw the wheel assemblies on to the end of each riser. 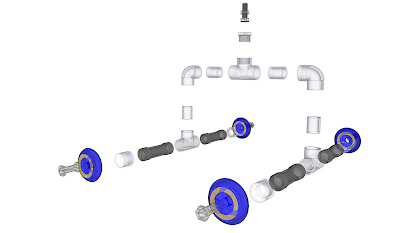 Glue a connector into each smooth end of your thread T-joint. Glue a 90 degree elbow onto each of the connectors. 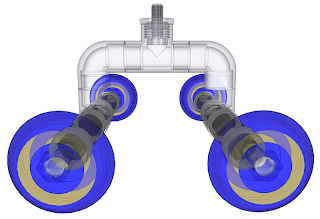 It is critical that this assembly is true if all 4 wheels are to sit level at once. Drill a hole in the center of screw in PVC plug. With a washer on the bolt, screw it through the hole you made. 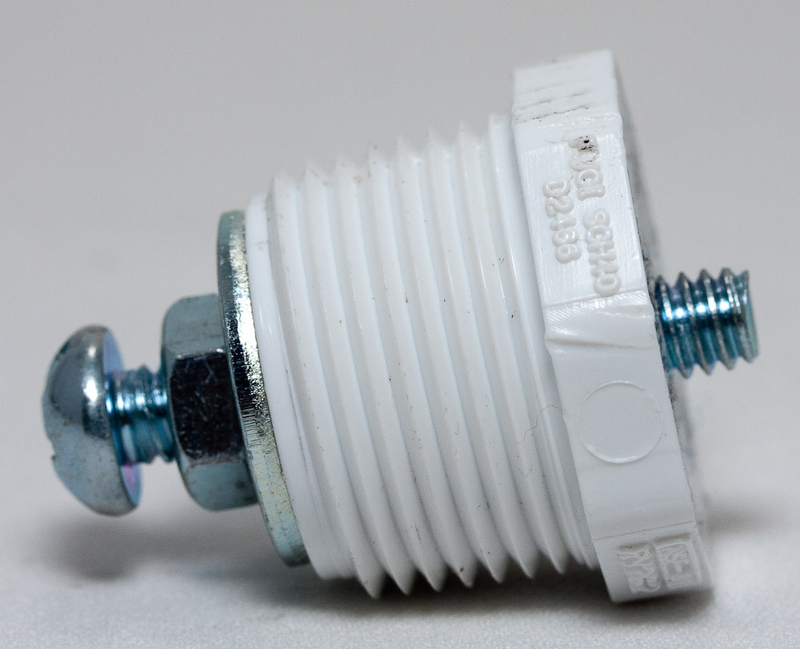 Using a set bolt on the screw and the washer make the screw protrude about a 1/4” through the plug and is solidly in place. Screw the tripod mount into the threaded t-joint on the body. Mount any small to medium sized tripod head on to this. A small ball head is the most compact for traveling but a pan or small fluid head is easier to use. Slip the running gear onto the body. Friction will be enough to hold them in place but they should be loose enough to set a turning radius. Mount the camera onto the tripod head and you’re ready to roll. Just like any other camera movement, using the table-top dolly takes a little practice to get smooth. Use it to circle, or describe an arc, around or past an object. You can also dolly past or along a subject. You can also truck into or out from a subject. If a small subject is too low relative to your camera’s lens a small, improvised stage can be used (an upturned glass is useful). Set the radius of your turn before moving the camera and don’t try to adjust it in the middle of a movement.